A first app of its kind in the app store allowing the user to produce a picture in picture effect in a matter of minutes. In a PE classroom this could be used to do a comparative analysis between pre and post lesson skill development. 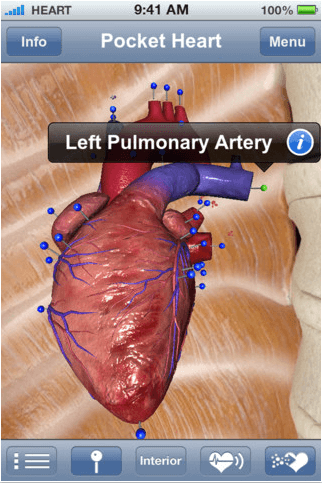 A brilliant way to learn and review the function and structure of the heart in 3D. Students can explore the case studies in full detail or complete a ‘locate pin quiz’ to test their knowledge. Connect your device to a larger screen and share the app with your student group. This nifty little app allows you and your friends to film the same event from multiple angles. Simply login to the application and start recording, the app will determine your location and others within your proximity and seamlessly piece together a video including all of the various angles. In a PE classroom students could use this to film high quality sports footage within a SEPEP film crew role. A great way to track your daily water consumption in a very visual and intuitive way. Use it as a prompt to discuss hydration and how various conditions effect required intake. Check out the other top app lists here – Part 1 – Part 2 – Part 3 – Part 4– Part 5 – Part 6 – Part 7 – Part 8 – Part 9 – Part 10 – Part 11 – Part 12 – Part 13 – Part 14 – Part 15 – Part 16 or grab the PE Apps app for a great one stop collection of the best PE apps.